Here was the challenge: how to turn a family home into one that would keep its owner happy – and in place – for the rest of her life. 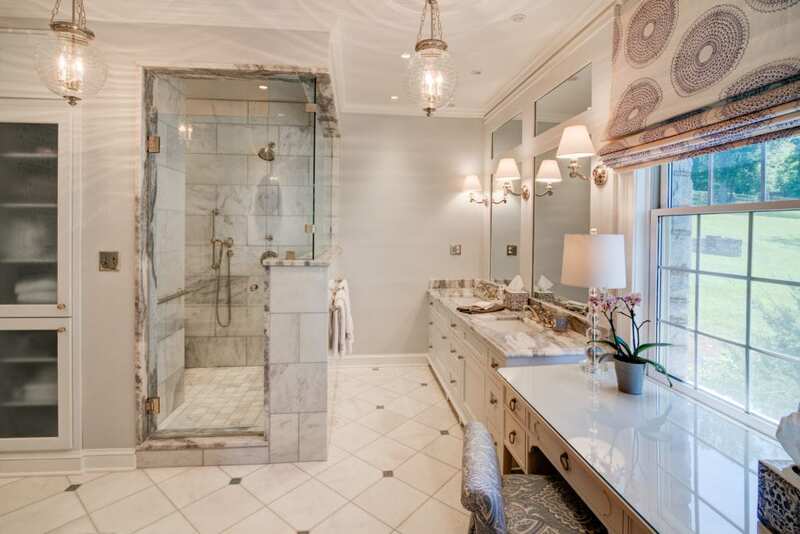 It was the challenge that interior designer Betsy Edwards met with the help of Living Stone Construction. And it was posed by Annette Pace, who loved her farmhouse‐like home in north Asheville’s historic Beaverdam community but hadn’t lived in it for years. Annette, who raised her sons in the house, didn’t want to give it up. But being a planner, she was planning ahead and wanted to see if Betsy could turn the house into a pretty home that would shelter and nurture Annette as she grew older. Betsy, whose business (Betsy Edwards Design) has reconfigured houses, hotels and restaurants all over the world, felt the home’s magic the moment she first saw it. “You could just feel the energy and beauty of it,” she says. Annette, living elsewhere at the time, had expressed that she wanted to live in the house for the rest of her life. So as Betsy walked through its rooms, she envisioned how they could be changed to accommodate her client’s later years. Some updating needed to be done, certainly, but cosmetic changes alone wouldn’t achieve the longevity that many homeowners want these days. Aging in place ‐ a term used to describe construction details that allow a resident to enjoy an independent life for years ‐ often means wider doorways and no‐threshold showers. In Annette’s case, it meant a master bedroom suite on the main floor – a space she suggested might be made out of the large room that held the family pool table. The space had many things going for it. It was large and well sited. It had a 22‐foot ceiling. But where else would she keep the pool table? She certainly didn’t want to give it up. It was where her sons had played with their friends, where she had spent many hours playing with them. The pool table was the center of many happy memories. Betsy considered the table. Then she considered the height of the room. The space could easily accommodate a loft, she thought. Tied into the upstairs bedrooms, that’s where the pool table and the game room could go. Above the new bedroom, it would never be far from Annette’s thoughts. All the pieces seemed to fall into place. appreciated its solid construction. Sean seemed honored to add his work to the home’s grand design, Betsy says. The plan would work well with the existing structure of the house, Sean told Betsy. Support would have to be added in the basement, but it would be easy to tie into the existing plumbing and air systems. Best of all, the footprint of the house would remain unchanged, he said. Betsy’s plan called for building upward, not outward. Construction began, and Betsy, the manager of the project, dealt on a near‐daily basis with Frank Turchi, Living Stone’s superintendent on the job. “He’s a great guy,” she says. “He’s the kind that no matter what is thrown at him, he’s always calm.” Turchi handled project surprises and additions with aplomb, whether it was refinishing floors, changing out electrical lines or putting into the new bedroom the kind of push‐button light switches that are used in the stately Biltmore House. “Repairing, refinishing, painting and cleaning – he was great,” Betsy says. She was impressed with the subcontractors that Turchi and Living Stone brought in, including the woodworker Jason McDowell who showed up on one of his days off to ensure that a built‐in recipe shelf in the kitchen and the succulent garden planter was done correctly. “It was a point of pride for him,” Betsy says. “They were some of the best subcontractors I’ve worked with. It was very much a family unit,” she says, tapping into the team concept that Living Stone employs to get the construction, design, systems and landscaping teams working together from the very beginning. Betsy has worked with contractors the world over and is especially familiar with those in the United States. Living Stone Construction is “a little different,” she says. Betsy says she looks forward to working with Living Stone again. The company has made many friends of its clients, as does Betsy, who now considers Annette among hers. Annette is happily returning to the home she loved so much, a home she was able to reimagine thanks in part to Sean Sullivan and his crew. “I know she’s very pleased with how it turned out,” Betsy says.